No, we didn’t go to a seafood restaurant, we took some time to venture down to Port Charlotte. 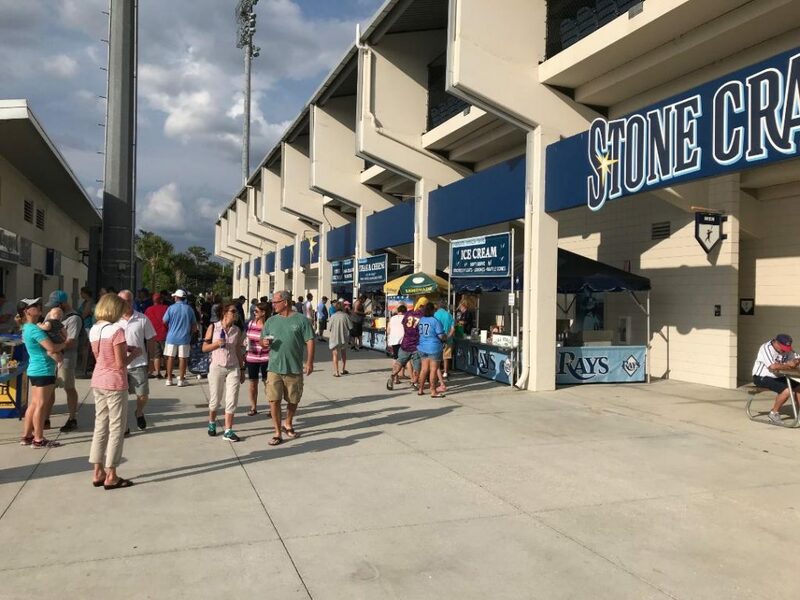 Where we saw the home opener of the Charlotte Stone Crabs minor league baseball team. We have seen the Florida Firefrogs, the Jupiter Hammerheads and the Lakeland Flying Tigers. So this was the latest in our forays out to see all that Florida’s minor league has to offer. 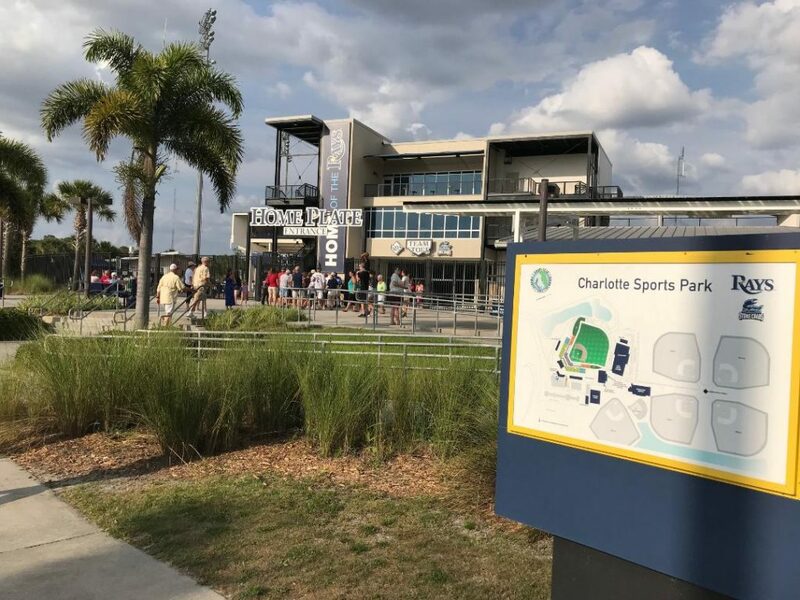 The Charlotte Sports Park is a sprawling, open air sports facility. Like some of the others we have visited, most of the concessions that ring the playing field are located in pop-up tents. Only the official concession stand and the souvenir store have permanent facilities. That being said, there is a luxury hospitality suite level, two outfield berms, a children’s play area and an outfield bar among other amenities. The complex also is connected to Tippecanoe Environmental Park which features walking trails, a boardwalk and a canoe/kayak launch. The 7,500-seat stadium was better than half full for the team’s opening night against the Fort Myers Miracle. As we always do, we asked the folks at front office what would be the best seats. We ended up right behind the dugout. We had a great view, and were protected by a net that stretched dugout to dugout. The game itself was an exciting one. The Crabs started out slow, falling behind due to some lackluster pitching. But in the later innings they came on. Batters provided a season-high 12 hits coupled with some exciting heads-up base running. They won 7-4 before the hometown fans on opening night. Possibly one of the highlights of the game was that four Crabs pitchers combined for 10 strike-outs. That earned each of the fans a Junior Frosty at their participating Wendys. It was an exciting game with lots of action and uncertainty. However, there were a couple of disappointments. One was that we could not listen to the call of the game. It is an internet broadcast, but it runs about two minutes behind the actual on-field action. Secondly, although there were a lot of features such as between-inning contests and honors for veterans, the Stone Crabs have no mascot! We were stunned and would recommend the team look at adding this great on-field feature. 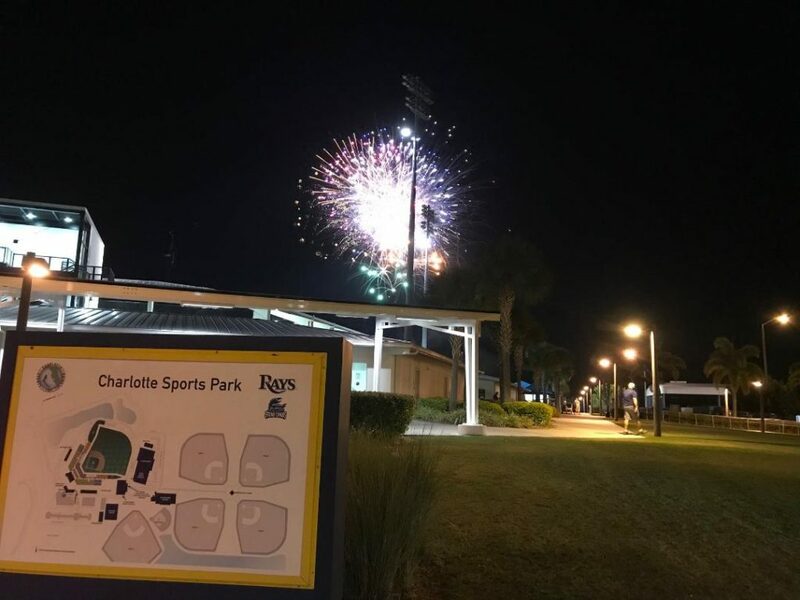 They celebrated opening night with a fireworks display. To end the evening, there was a wonderful display of fireworks, which helped disperse the big crowd in an orderly fashion. In all, it was a great night for baseball. 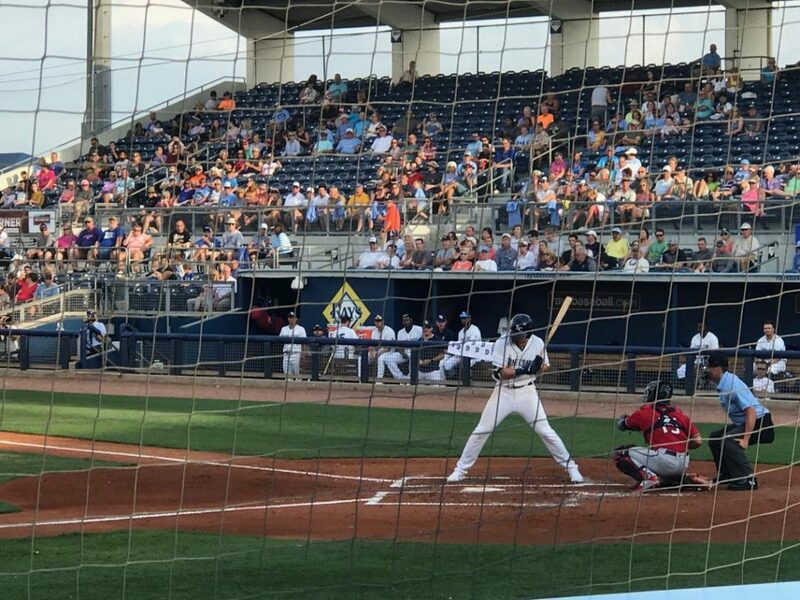 Just with all the minor league games we have seen, there was plenty of action and fun at a great pricepoint. A sojourner across the Sunshine State from the Redneck Riviera to the Keys and from sea to shining gulf.